Currado, Arthur J. Currado passed away peacefully in his home in Port Richmond on Monday, Dec. 12th after a lengthy illness. He was born in Elm Park and resided at his present address since 1952. He enjoyed golf, baseball and bowling and his hobbies included reading and long walks in Clove Lakes Park up until 5 years ago. 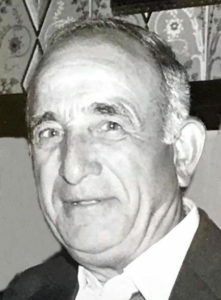 Artie was married for over 75 years to his loving wife, Vincennza (nee Denino) and father to his daughters, MaryAnn Silvestri, Carol Moeller and the late Eileen Arnone. He is survived by his sister, Rose Bottiglieri and dear grandfather to Lynette Silvestri, Denine Kauffman, Kerri Bringslid, Charles Arnone, Theodore and Thomas Moeller and 14 very dear great grandchildren. The funeral will be from Cherubini-McInerney Funeral Home (formally Meislohn-Silvie) 1289 Forest Avenue PR. On Thursday at 10:15am with a funeral mass at St. Roch’s RC Church at 11am. Entombment at Moravian Cemetery. Friends are invited to visit at the funeral home on Wednesday from 2-4 & 7-9pm.